Penny stocks aren’t very prestigious. The big money is made elsewhere. Yes, this is precisely the reason Timothy Sykes could turn $12,000 into $3.5 million and teach other people how to replicate his success. Today the 32-year-old trader from Orange, Conn., works out of Miami, Los Angeles, and New York. He said he can work from anywhere, trading stocks that aren’t worth much more than a dollar, aren’t properly regulated and only trade over the counter—the domain of scammers and gamblers. Yet Sykes did enough research to find certain patterns in stocks that are likely to be scams. He profited immensely and coached two people to make over $1 million over the span of a few years. Epoch Times: Mr. Sykes, how did you get started trading penny stocks? Timothy Sykes: I think I overworked my genetics and got injured while playing tennis during my senior year of high school. So I had a double tendon surgery, where they take a tendon out of one arm and put it into another. I was walking around with two casts on my arms like RoboCop. I couldn’t do much. They gave me control of it; it was $12,415. They thought I would lose it all. And instead within four years I turned it into $1.7 million trading penny stocks. But no one grows up wanting to be a penny stock trader. Epoch Times: So why did you get into it? Mr. Sykes: I got started because they move so fast and the stocks are cheap. If you have a small account of $12,000, even if you invest in Google, what are you going to do? You might turn $12,000 into $16,000 in a year. That really didn’t spurn my interest. But when you have penny stocks moving 20 percent, 50 percent, 100 percent in one day. Sometimes my account would go from $12,000 to $20,000 in a day and that was crazy. Epoch Times: What was your first strategy? Mr. Sykes: Buying stocks as they broke out. It’s kind of funny to look at it now, but back then the biggest indicator for a stock to break out would be when they added dot.com to their name. One of my biggest wins was on Sportsman’s Guide—boring stock, they sell camping equipment. But then they changed their name to SportsmansGuide.com and they were going to take over the Internet. I tripled my money in three days. For a good six months, my whole strategy was to spot companies when they added dot.com. I made $720,000 in four months in 2000 when I was in college with that strategy. Epoch Times: That was the dot.com craze. What happened after? Mr. Sykes: The last eight months of 2000 I only lost $10,000. The reason: One of my top rules buying these companies as they break out, was to cut losses quickly. Epoch Times: And after the dot.com bust? Mr. Sykes: I excel at spotting scams. That’s what I’ve done for the past 10 years. There is just not a lot of competition in penny stocks. Most smart people gravitate toward other fields because there is more money. But I stuck with this small niche because there is just no competition. Ninety-nine percent of people are either scammers or idiots who think these companies will make a lot of money. If you bring in some kind of meticulous study and a little chart reading capabilities, you have an advantage over everyone else. Epoch Times: How do penny stocks work? Mr. Sykes: Most penny stocks do reverse mergers with a publicly listed shell company, which has no assets. But legal filings are in order and they have a listing. Then they become public, they file a few press releases, the stock goes up and they get financing because it’s a more liquid entity. They are smaller more speculative names and because they have no revenues, it opens the door to scammers. The scammers hire promotional mailers like in “The Wolf of Wall Street” movie. They used to do telemarketing, but now they use promotional mailers to send out ads via email: “Look, we just found a billion dollars worth of gold in Peru.” And it’s all not true. But they put their little disclaimers at the bottom. Those are the outright scams that I like to short-sell. Most people think that penny stocks are thinly traded and illiquid. And most of them are. But there is a good 10-20 of them that are trading 50 million–100 million shares a day. There is plenty of liquidity if you stick to the active names. Epoch Times: Can you name an example? Mr. Sykes: I am currently short Centor Energy Inc. (CNTO). I just got halted by the SEC. CNTO has no cash, no revenues, nothing, but they are valued at $200 million because of a promotional email campaign that got sent out to millions of people. They said they found all this oil and somehow they only paid $100,000 for this oil field that is supposedly worth billions. Of course that’s not true. Epoch Times: What about regulation? Epoch Times: So when did you decide to share your strategy? Mr. Sykes: If I’m somebody who is able to trade and can teach, then I have an advantage. That’s the biggest proponent of my business. I just show you everything I do whether I have gains or losses. All I have to do is prove to you that I am real day in day out. That gives me an advantage over 95 percent of the trading instructors out there who don’t show their trades. The problem I have is that people find me too late. They go down with these scams and then they see my blog post warning them but I didn’t catch them in time. That’s what Jordan Belfort’s clients, the “Wolf of Wall Street’s” clients, experienced. He was pumping up these stocks and he was the insider. He was selling shares. He used his own telemarketing team to unload these stories on unsuspecting individuals. I want to help people avoid this problem and make money at the same time. My 3,000 plus students can benefit from any trade that I make. The problem when I first started was that I didn’t have any mentors. There were no rules for trading. I was fortunate to start in 1999/2000 when it was easy, but if you are starting now, you have no guidance, it’s just tough. Epoch Times: How do you coach? Mr. Sykes: I need to do more real world stuff, but most of it is online. I have 1,500 video lessons on my blog. It’s $100 per month. I think most people can afford that; it’s just a question of getting people to watch everything. Fifteen hundred videos is a lot of material. Epoch Times: What about your top success stories? Mr. Sykes: The top driver of any kind of business is success stories. Tim Grittani, my top student, he turned $1500 into $1.3 million; he is my single biggest success story. He joined me in 2011. My first one was Michael Goode. He joined me five years ago. He already had $100,000 but now he is at $1.2 million. To show that somebody can cross $1 million in just a few years through meticulous study and consistent profits, it’s hugely motivational. Timothy Sykes is a highly ranked stock trader, entrepreneur, and penny stock expert. 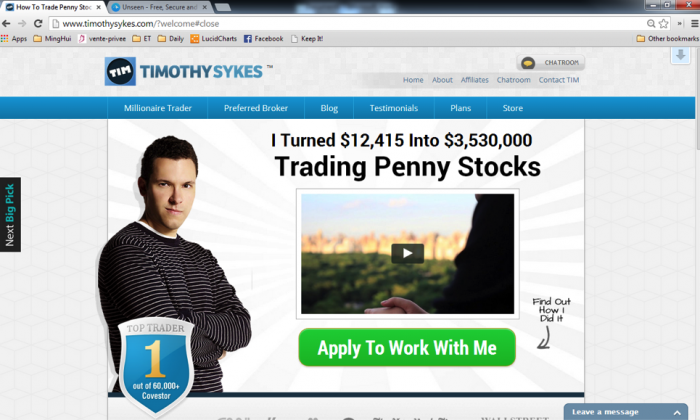 In his blog www.timothysykes.com, he shows live trades and offers education on penny stock trading.